India is perhaps the only country where goddesses are still widely worshipped. The origin and nature of many of these present day Goddesses and their cults go back to primordial times. But the centre of all mother goddess worship is the desire to propitiate and praise the powers of nature for promoting growth and fertility. The nine day autumnal festival of Navaratri is an expanded and systematized form of such a fertility and thanksgiving festival. During the medieval period, kings and rulers, as representatives of the people, took over the worship of the Mother goddess and added a spectacular tenth day material festival called Vijaya-dashami, popularly known as 'Dasara'. This was intended to placate the goddess to grant victory in battles. The Mysore celebration of Navaratri and Dasara is an integral part of this great martial tradition of Mother goddess worship. This work traces the origin and background of this festival from early times. It then describes the various traditional rituals as prescribed in the Dharmashastra (moral and religious law) texts. 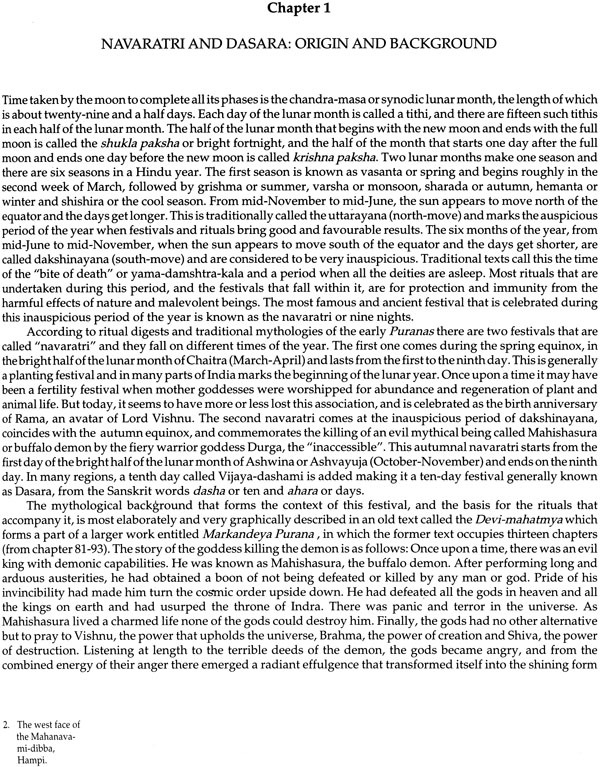 Eyewitness accounts of the celebrations of this grand festival during medieval times, particularly in the famous South Indian Kingdom of Vijayanagara, are added in the third chapter. 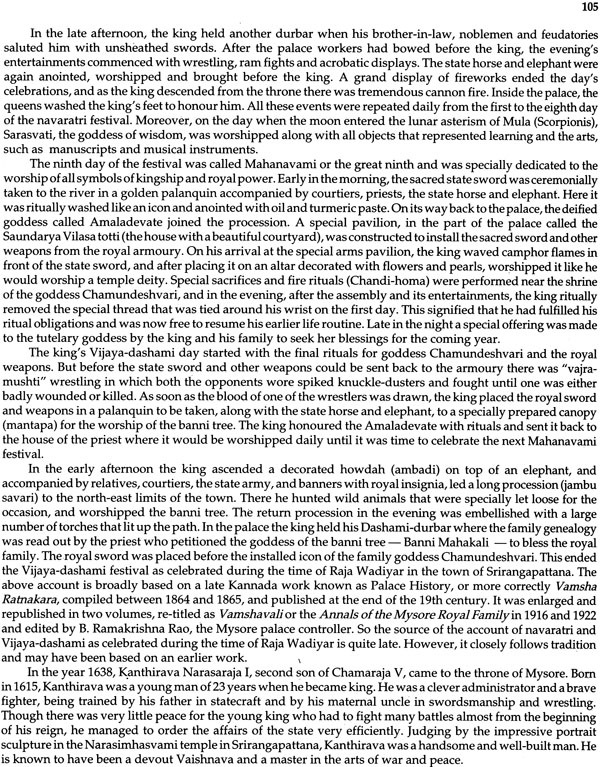 This forms a background to the last chapter that gives a graphic and comprehensive account of the ten day festival as celebrated today in the Mysore place by H.H. 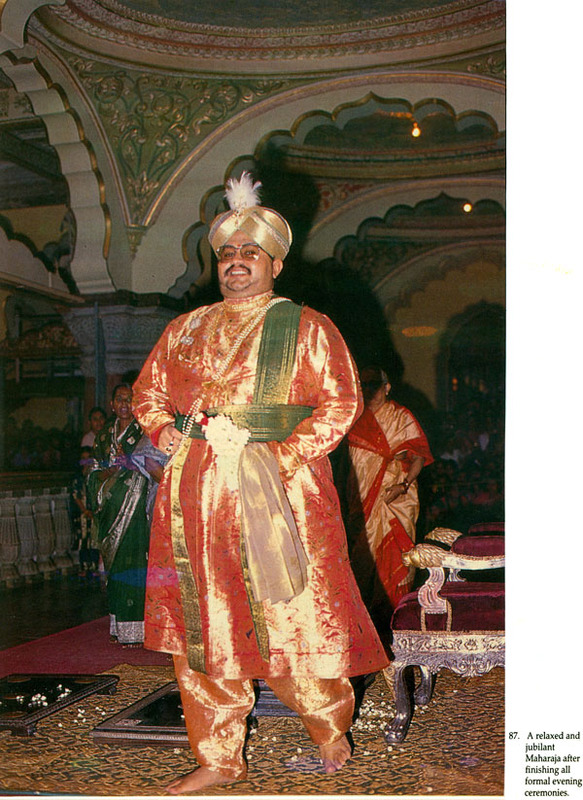 Srikanthadatta Narasimharaja Wadiyar, heir to the cultural and religious traditions of Vijayanagara. The dazzling and intimate photographs by Gajendra Singh Auwa, brother in law of the Maharaja, add a personal dimension to the book that is both unique and rare. Sivapriyananda was born into the royal family of a princely state in South Gujarat. He studied Sanskrit and Pali at graduate and post-graduate level at Poona University. He also studied for the traditional 'Kavya-tirtha' of the Bengal Sanskrit Association, Calcutta. After this, he went to England to study Archaeology at the London University. He took sannyasa in 1974 in Rishikesh, and since then has visited many ashrams, saints and centres of traditional learning in search of forgotten and neglected aspect of Indian religion and culture. At present, he is finishing a book on Mysore Traditional Paintings. His other publications include Devotional Songs of Narsi Mehta (Motilal Banarsidass), Secret Power of Tantrik Breathing and Astrology and Religion in Indian Art (both by Abhinav Publications). Gajendra Singh Auwa is a freelance nature and architectural photographer who also has his own wild life Resort in the South Indian sanctuary of Bandipur near Mysore. His architectural coverage includes forts, palaces and temples of India. His nature photography includes wildlife, wilderness, landscapes etc. Having married into the Mysore Royal family, he has had ample opportunity to cover comprehensively the private Dasara functions at the Mysore palace. This Book on Dasara written by Shri Sivapriyananda, Maharajakumar of Dharampur along with photographs by My Brother-in-law, Bauwar Sahah Sri Gajendrasingh of Auwa is very interesting as it gives factual account of the manner in which Dasara is celebrated all over the country. This book is divided into four parts. The First parts deals with the origin of Dasara and the manner in which it is celebrated all over India year. 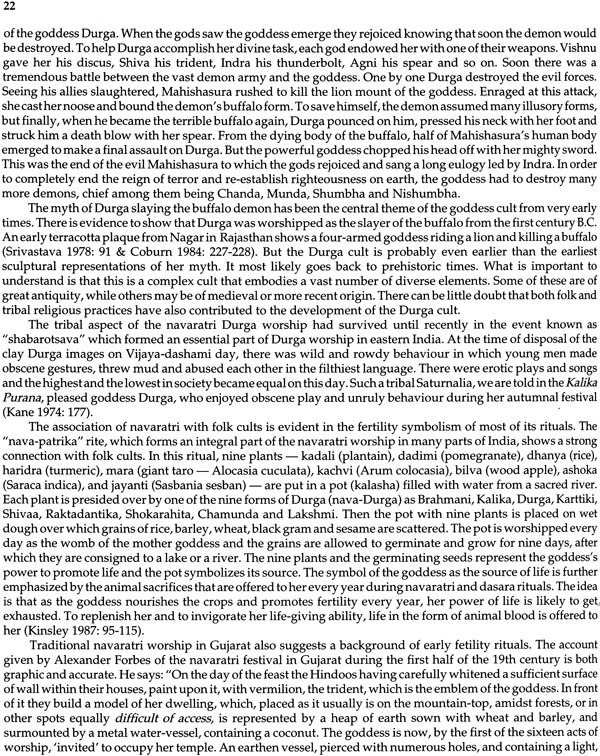 This makes available first hand account of the significance of Dasara as practised in India to keen students on the subject. The Second part deals with ritual aspects of Dasara as enunciated in ancient texts such as Markandeya Purana, Kalikoktha purana and Devi Mahatmye and Sapthasathi. The basic concept of all these texts is the triumph of 'Good over Evil'. This has been brought out by explaining the significance of various Religious symbols and esoteric values of sacrifice, worship, and sacred rituals that are practised and followed during Dasara. 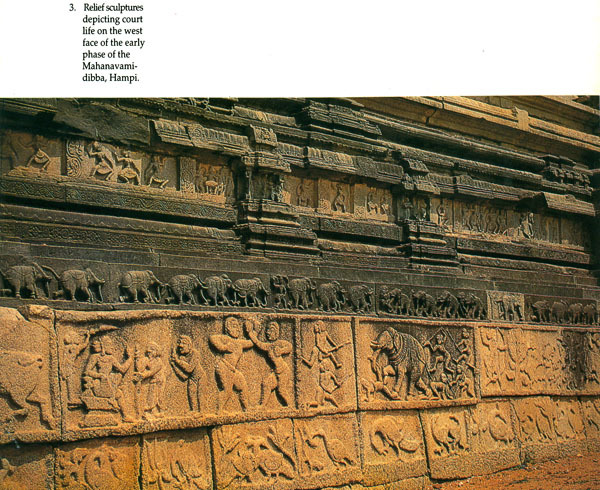 The third part deals with Dasara as practised in ancient Vijayanagar Kingdom and consists of visual factual account of various historians and travelers who visited Vijayanagar. This is highly narrative and gives graphic description of eyewitness accounts of events as seen by visiting foreign writers, Historians, to the Royal Court in general. 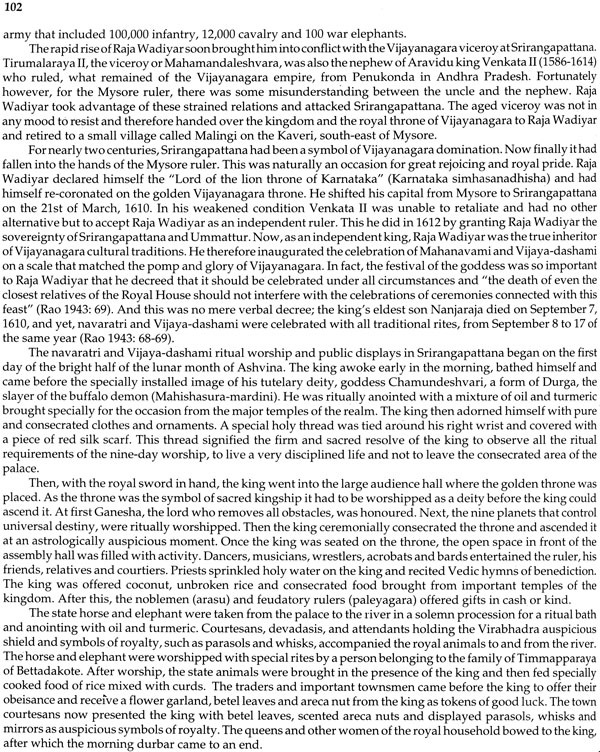 Last part of the book deals with Dasara as practised in Mysore almost four centuries ago and during the life time of my Grand uncle His Highness the Maharaja Sri Krishnaraja Wadiyar IV and by my Father late His Highness the Maharaja Sri Jayachamaraja Wadiyar and is still being practised and performed by me even to this day. Series of photographs have been included in this book to give visual account of Dasara Durbars, Ganapathi Pooja, Saraswathi Pooja, Kalarathri Pooja, rituals connected with Ayudha Pooja, Shammi Pooja and also gives a detailed account of spiritual, esoteric worship and rituals that was practised by my predecessors and also followed by me now about which very few people are aware of the real significance of private worship and rituals but the real essence of Dasara celebration is rituals and worship tht takes place for from the view of the public in general. This book definitely is trying to visualize the Religious rituals and aspects to the general public who are often unaware of the real significance of the Dasara. As I have already stated above, Dasara is a festival where there is triumph of 'Good over Evil' and that everybody who worships the various Gods and Godesses during Dasara do so signify that justice lies in truth and nothing but the truth and, that from truth alone that nectar of justice flows and prosperous. 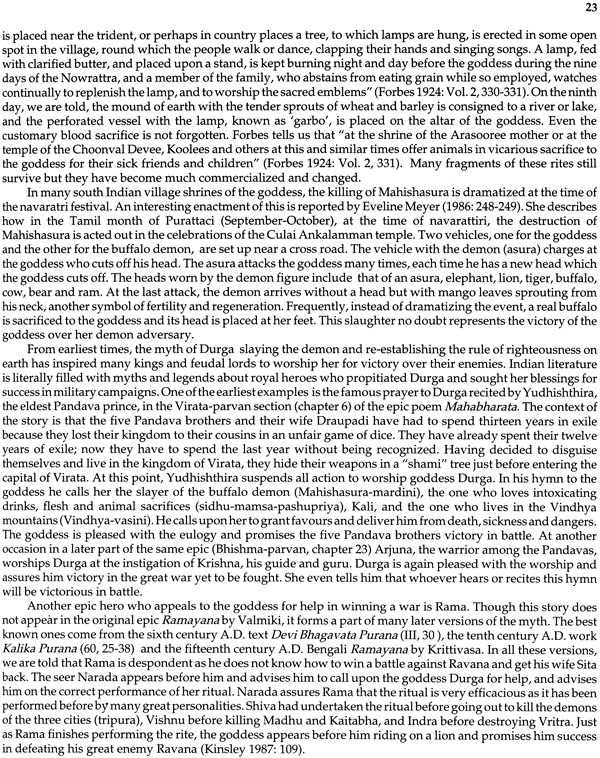 The author's notes and accounts reflect his vast interest in studying not only historical aspect but also the traditional, classical, Tantric texts and scriptures and has given personal account of Dasara as seen by him in comparison as to how Dasara was practised earlier. Those who read this book will surely have a very rewarding and satisfying experience in detail about the mystic myth of Dasara as practised, as seen and as prescribed in various Religious texts mentioned above and as now practised in Mysore including its esoteric values. India is perhaps the only country where goddesses are still widely worshipped. The origins of many of these go back primordial times when Mother Goddesses and fertility cults were the predominant forms of religious expression of mankind throughout the world. Though over the centuries, many new and different religious beliefs and cults have influenced the form and worship of goddesses, the faith in the power of divine femininity still plays a very significant role. A vast majority of people in India still live in villages and follow an agricultural life style. Their life is therefore governed by the seasons and the fertility of the soil-aspects of nature which, even in the present age of science, are precarious and uncertain, to say the least. Traditions handed down from remote antiquity stress the central role played by Mother Goddesses in promoting growth and fertility. It is natural that when faced with an uncertain future, people call upon th4e ancient goddesses for help in bringing rain and fertilizing fields. Every village in India has a presiding Mother Goddess (Grama Devata) or Amma, who lives under a tree, or on the edge of a like, or in a large stone, or in a shrine, and who is entrusted with the prosperity and well being of the entire village. During a good year, when there has been adequate rains and a fair harvest, the village goddess is thanked for her nourishing help and worshipped in a thanksgiving rite. The navaratri festival is an expanded and systematized form of such a thanksgiving ceremony. In later years, kings and rulers, as representatives of the people, took over the worship of the Mother Goddess and added many grand and spectacular ceremonies. In many cases, the Mother Goddess cults were turned into royal and military rituals intended to bring victory in battles. In time, even these became a part of a rich and complex tradition. But at the root of all the grandeur and show was the very human desire to placate the powers of nature and understand the mysterious source of life. The Mysore royal celebrations of navaratri and Dasara are an integral part of this great tradition of Mother worship. Though the times have changed, and the old pomp and glory have given way to mediocre life styles, no change can take away the cultural memory of a glorious, rich and meaningful tradition. 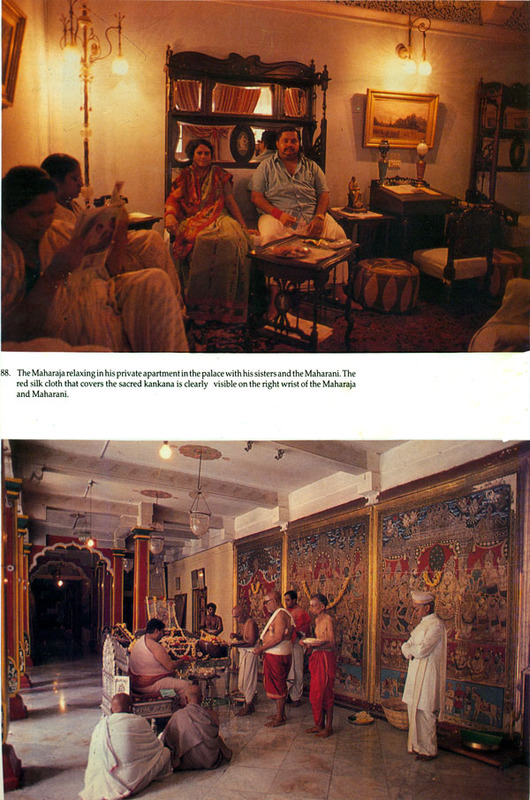 This book, with its unique photographs, is an attempt to capture a glimpse of this great tradition.